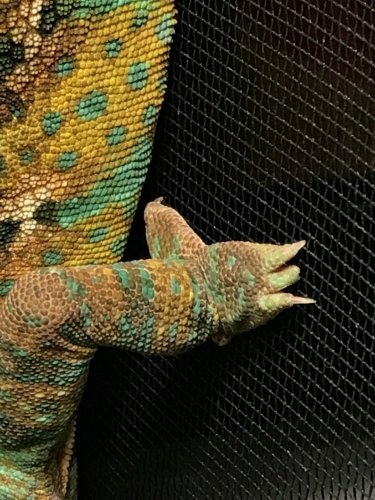 Just saw my cham crawling on his cage and noticed one of his nails looks much shorter than the others! I think he must have fallen while climbing or something but I want to make sure he will be okay? He seems to be using his foot and crawling just fine. Don’t know how it happened, as most foot injuries are caused by forcefully removing them from their cage but I rarely ever take him out as he absolutely hates it. Is there anything I can do? Or is it even broken? A lot of keepers will put things on the sides of their enclosures to give their cams somethi g else to climb on other than the screen. Screens can snag and take off their nails. Do you have any pictures of the enclosure?